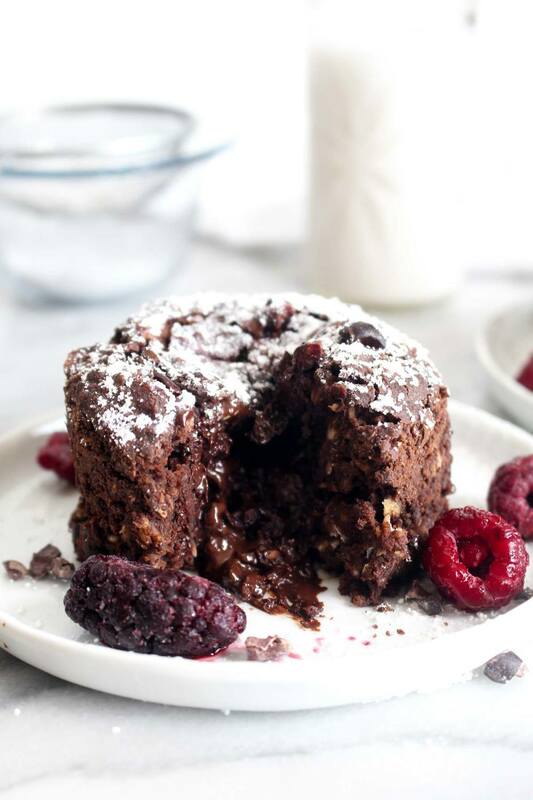 This Chocolate Lava Baked Oatmeal Cake is a rich, chocolate-y breakfast cake that is secretly healthy and made with whole food ingredients! Preheat the oven to 350 degrees and coat 4 ramekins with nonstick cooking spray. In a bowl, whisk together the oats, oat flour, cocoa powder, chia seeds, baking powder, and salt. Set aside. In another bowl, whisk together the coconut milk, maple syrup, and vanilla extract. Add this into the dry ingredients and stir to combine. Set aside. Using the microwave or a double boiler, gently melt 2 ounces of the chocolate. Add the melted chocolate into the batter and stir to combine. Take the remaining chocolate and cut it into 4 even pieces. (You can also combine smaller pieces into 4 even piles.) Stuff the chocolate into the center of the cakes, and use a spoon to cover them with batter. Place the ramekins on a baking sheet and bake in the oven for 25 minutes. Let cool for 5 minutes and serve.